After an incredibly successful race weekend at Silverstone, the Balfe Motorsport team is hoping that it can continue the good form at Imola, for round four of the FIA GT Championship. A good, solid result on home soil was always the aim and second on the road to the factory Porsche was the best way to bounce back from the slightly frustrating and disappointing results at Monza and Magny-Cours. 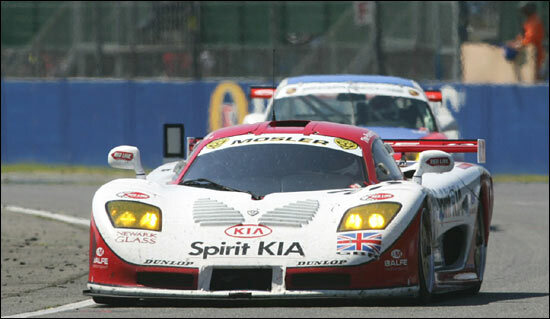 Imola should be a track which will suit the Spirit Kia, Spirit VW and Newark Glass Group-backed Mosler really well. The layout of tight sections and fast chicanes are what the car excelled on in Spain in 2004, so it is of no surprise that the whole team is looking forward to the meeting - especially Jamie Derbyshire, who had his hopes built up for the race in the Creation Lister last year, only for it to break down after a couple of hundred yards. Although Derbyshire has prior knowledge of the venue, it will be a completely blank sheet of paper for the rest of the team, including Shaun Balfe. Although he enjoys the challenge of a new track, certainly historic and respected ones like Imola, and is confident that after the opening free practice session, he will have his eye in and be ready for the rest of the weekend. The team has shone in qualifying this year, the Mosler the only car to have got close to the factory 911s over the first three rounds. Balfe has continued his form from 2003 and 2004 and has opened a few eyes as to what the Mosler is capable of. Another finish is the aim for the team this weekend. But, with improved performance and reliability in the Mosler now too, a more competitive race is also high on the teams mind in San Marino.